Incense from India is the best Indian incense we have ever used. Each scent is very good quality and has a lasting and true scent. We burn this almost exclusively here at Amphigory, and have a lot of customers who have been buying these scents from us for years. Quick tip: If you love Satya Sai Baba Nag Champa, look for the Durbar tag, any thing labelled with that has a similar undertone to it. 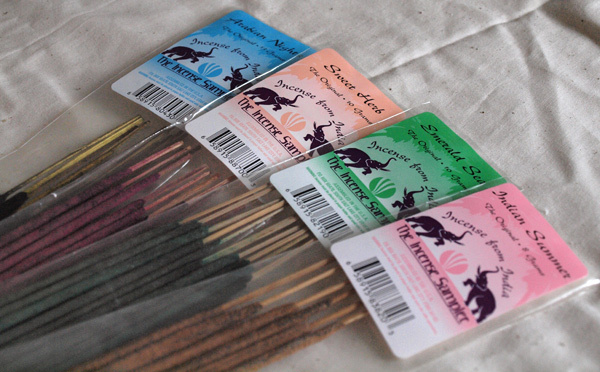 All Incense from India scents are just $2.00 per package for the standard sized package. They come packaged in a clear (biodegradable) cellophane package. We do offer bulk packages for EVERY scent listed and many not listed. Those are priced individually as they're different prices for each quantity. Please inquire if you don't see your favorite listed, we're happy to get it in for you. All incense are packaged by Gram weight. Because sticks are of variable weight, we cannot estimate how many sticks you will get per package. Generally 1 gram = 1 stick of incense, but this can widely vary. D=Durbar M=Masala Ch=Charcoal Co=Combination W=Woodbase. For explanations of these catagories, check out our incense information page. Sampler #2 Sampler of Sandalwoods. (may include scents like Rainbow Mist, Ancient Wisdom, Red Sandalwood, Tibetan Sandalwood) 12 sticks. Sampler #3 Sampler of Durbars. (may include scents like African Spice, Red Poppies, Meditation, Nirvana) 8 sticks. African Spice A rich heady spicey incense. 8g. Amber Extra An earthy exotic Indian amber. Combination, 12g. Amber Resin True amber, not sweet, made with ground amber. Durbar, 7g. Ambrosia A soft, yet potent nag champa-like fragrance - truly food of the gods and goddesses. Surprisingly spiced, I said to my husband that I couldn't wait for him to smell this incense when he got home. Soft and lively. Durbar, 8g. Pure Sandalwood A true charcoal based sandalwood scent, warm and inviting. This is the nearest scent that exists to the mourned Ancient Temple Incense from India incense. If you liked that, you may love this one too! Charcoal, 9 grams.